Here is what I have myself signed up to do this spring. Would love to see former students and other old friends. Click the links or contact your Harvard Club to sign up! Then I'll be ready for a vacation! Does the Controversy Over the Student Government Funding Mean Anything? The student government at Harvard, known as the Undergraduate Council, has long been a weak organization. Seats go uncontested, and the last presidential election was won by a guy who pretty much made a joke out of his campaign. Part of the reason is structural. Harvard has a strong collegiate staff, so some services that student governments provide at other universities are centrally provided here. That has always helped explain why the student government here gets less funding than it does elsewhere. I think part of the problem is also the general problem of diversity. Harvard students are interested in so many different things that it's hard to find a majority opinion on anything that matters. The endless controversies over the choice of bands for Springfest seem to me almost inevitable; there simply is no majority opinion on musical tastes. Over the past month there has been a somewhat puzzling series of Crimson stories about the UC's desire to get $250,000 more per year to expand its activities. The Dean of the College and the President have said sympathetic things but have observed that they are dealing with budget problems of their own. I paid little attention to this until I suddenly realized that I had been there, fifteen years ago, when the UC wanted to raise the fee from $20. I eventually decided that should happen, and I wrote an op-ed for the Crimson explaining my view. I think it went to $35 shortly thereafter, so the fee has already more than doubled since then. My general view has always been that extracurricular activities should be supported, at least the ones that students learn something from or that keep them healthy. (I have always been less sympathetic to the identity-politics groups.) Aside from whatever practical lessons such group activities teach about cooperation and leadership, and what intellectual or career-oriented skills they may foster, they on average tend to reduce drinking. Oh, I know all about the rugby team and the initiation rituals, but in general, I am persuaded that students who are busy doing something are less likely to spend their evenings wasted than students who have nothing to do but pass their courses. Add to that, the fact that Harvard has apparently reduced its support of club sports to save money, so the UC has a reasonable argument that it needs to take up the slack. I'm not sure I like the vector there: to save money, one department reduces its services to students, so students ask for money to replace those services, except the student body itself controls how that money is allocated. The pirouette may leave students paying the same amount of money and the university losing control over its allocation, while proudly announcing that it has reduced its budget gap. But here is the part of the story that I don't get. "Mayopoulos and Goffard, who hosted a rally in the Yard before their meeting with Faust, said that they discussed the additional funding’s importance with the president and how it might be acquired, either through a term bill increase or directly from the University." So they hold a rally, and then ask the president for a quarter of a million dollars. She says "no" to direct funding, and quite rightly directs them to Dean Pfister to talk about the term bill mechanism. But the UC doesn't stop here. "Mayopoulos said that that Harvard 'should bear a significant amount of the cost of extracurriculars' on campus. 'If an increase in the term bill is necessary, this increase will be matched by the University so that students are not alone in this,' he said." Probably this is just the kind of low-grade populism for which the UC has always won scorn, and I should leave it alone. Still, it's embarrassing for the future leaders of the free world, and I worry that it's part of the infantilization process I have been observing for some time. It's one thing to ask for the student government to ask permission to raise the term bill fee. Every time such a request is granted, there is the potential for an instant plebiscite. If students don't want to turn over their money to the UC, they can opt out. Just as in any representative democracy, the expectation of the electorate for prudent spending of resources raised through taxation provides a counterweight to the ambitions of the political class to expand the central budget. It's a healthy tradeoff. It's so much easier, and less realistic, for the UC just to ask the university to turn over the money and trust them, rather than for the UC to ask the entire student body to trust them, one term bill payer at a time. Acting like a teenager asking for an allowance is so different from asking for authority to raise a voluntary tax on your constituents. Holding a rally over this, when there are real problems in the university and in the world worth rallying over, is childish. My goodness, what do our students think about the relevance to them of political persuasion and civic action? Isn't there a teachable moment here? The Crimson reported a few days ago that Harvard was now teaching a poetry course in which students were not allowed to ask questions for the first hour, so as not to interfere with the filming for the HarvardX version of the course. On reading that I had a momentary reaction, a vague sense that Harvard had crossed some educational Rubicon, and that sometime in the future someone would point to this little article as a hinge point in the history of higher education. But I pulled back, for a variety of reasons. There are lots of lecture courses in which students do not ask questions anyway. This professor was making a point of having a much livelier conversation with the undergraduates for half an hour after the recorded portion of the lecture, which is a lot more than I or many of my colleagues do. I do my own experiments in online instruction, through the Extension School, which makes video recordings of my lectures available to distance students, and while I don't discourage questions (and my mic doesn't pick up students' voices very well), I am conscious of small changes in my teaching style---there are certain kinds of jokes I will risk making in a class that is not recorded that I won't make when the lecture will wind up on the Internet. Reports are that the poetry course is fabulous, and the production values are very high; as an example of questionable pedagogy, many other courses would be better targets. And I may also have hesitated a bit because the professor is married to Larry Summers, and I was not confident that my judgment was impartial. So I let it go; maybe there is no Rubicon there. Maybe we crossed it years ago. Maybe this is just a streamlet and the big river crossing is yet to come. Or maybe there is no discontinuity at all, and the various instructional modes will all wind up complementing each other in the best possible way once a few experiments have been evaluated. But when Professor Mary Lewis (no relation) wrote in this morning's Crimson, "surely the world’s best and brightest students don’t compete mightily to get into Harvard only to become mere backdrops to Harvard’s world stage," it sounded right, and I was glad she said it. She reminds me that my own decision to start teaching a flipped-classroom course, rather than trying to go the MOOC route, was in part a reaction to my fear of MOOCification, and was driven by the rewards I get from hearing chatter in the classroom, from bantering with students, from seeing light bulbs lighting up over their heads. "[W]e need a college-wide discussion," Professor Lewis goes on to say, "of how to maintain our pedagogical values in the brave new world of online education." Amen. 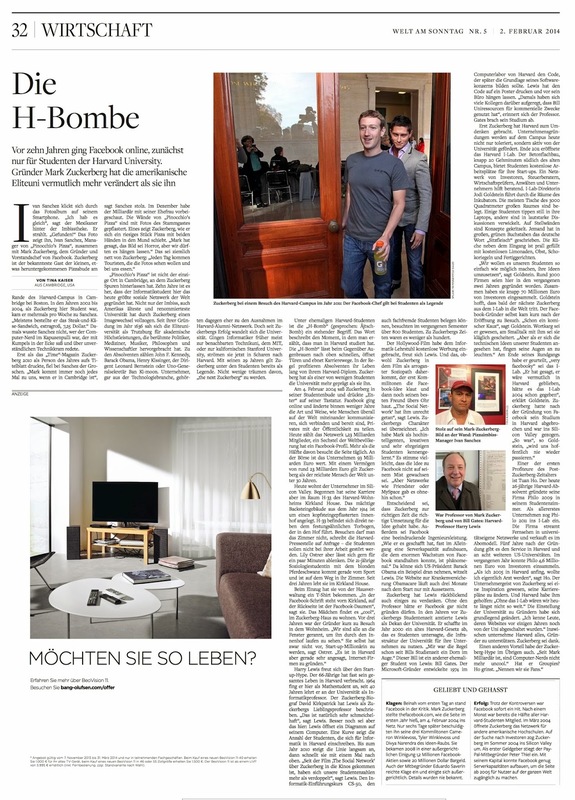 A German newspaper, Die Welt, has a nice article (in German) about Mark Zuckerberg's Harvard days, and also about the i-Lab and changes in Harvard culture. (At least I think it is all nice. I am relying on Google Translate and some imagination.) If you click through the photo gallery at the bottom, you'll find a photo of Harvard alums Tuan Ho and Chris Thorpe at the i-Lab. A photo of me seems not to be online but is in the print version. Also in the news is a nice story in the online (but not print) site of the Boston Globe about the WeCode conference that happened over the weekend (Women Engineers Code). It was an amazing enterprise put together 100% at the initiative of women in CS at Harvard, who deserve hearty congratulations! A friend of mine recently explained over dinner with some friends that a university has to be run like a business, but not too much like a business. He's right, and the fiasco about Harvard misreporting employee earnings to the IRS is a perfect example. The Globe ran the story on February 8. The university had long made available a certain benefit to employees, which the IRS considered taxable. So the value of the benefit would show as income on employees' W-2 forms. So far, nothing unusual. Through some combination of changes in tax regulations and changes in the benefit program, the benefit ceased to be taxable in the eyes of the IRS in 2009. But Harvard, mistakenly, continued report its value as income on employees' W-2s. Unfortunate, and costly to employees, because they had to pay taxes on what should have been nontaxable benefits. And now they have to amend their returns, perhaps several years of returns, if they want to get their money back from Uncle Sam. So far this is a straight business story. The tax code is a labyrinth and it changes all the time, and somebody made a mistake. It was a kind of mistake that probably happens all the time in corporate America, though institutions that are trying to help their employees (or increase their competitiveness inhering and retention) by offering benefits may be more likely to make mistakes like this than organizations that offer the minimum. In any case, it's a shame, and somebody should get scolded for it, or worse--maybe not even someone within the University, could be an outside contractor or consultant on these technical matters. Just like in a normal business. The place where Harvard shouldn't have acted like a normal business but did is in how it handled the affected employees. Its initial response was to send a letter to affected employees on January 21, 2014 -- about three months after the error was discovered. I have not seen the letter, only the reaction it drew from Harvard Law School professors Alvin Warren and Daniel Halperin. Here is their characterization of Harvard's letter. The letter misstates the law. It says that "IRS regulations do not allow the University to assist you in filing for a state or federal income tax refund." There is no such regulation. The letter does not accurately present the scope of the problem. It says that "For many people, the amount of the over-reported income was less that $200 per year." That is true, but for some employees, the amount exceeds $10,000. Nowhere is the total scope of the problem frankly presented. We were told in our meeting that more than 11,000 current and former employees are affected, with the total amount of overreported income exceeding $20,000,000. In our judgment, to mention in the letter only those employees for whom the amount involved is less than $200 per year is misleading as to the true extent of the problem. The letter fails to reveal all of the years for which there is a problem. The letter only discusses 2011-13, but the overreporting also occurred in 2009 and 2010. This fact is obscured by the vague expression in the first paragraph, which states that the problem involves "several years prior to 2014." The full scope of the years involved is never disclosed. The federal statute of limitations has run for 2009, so no refund can be claimed for that year unless an employee's tax return is still open due to, for example, an audit. The federal statute of limitations for 2010 runs on April 15, 2014, but the administration does not believe it can provide corrected W-2 forms by then. Most grievously, the letter fails to accept Harvard's responsibility to make its employees whole for its monumental error. Although 11,000 Harvard employees were victims of the administration's error, the only remedy presented in the letter is for each of the victims to file amended tax returns with the state and federal governments. The only "resources" offered in the "Frequently Asked Questions" that accompanied the letter are a couple of links to federal (not state) government tax sites. The professors say that Harvard should pay interest on the money the employees should have had and should underwrite the cost of filing amended returns. To do anything less … would indicate that the central administration does not believe that it has an obligation to take responsibility for its errors. Nothing could be further from the core values of truth and honesty that infuse teaching and research at this University. The Globe reports that the University has agreed to do as the professors suggest, so things seem to be back on the right track. The question is, why did it take these professors yelling for Harvard to do the right thing? I suspect the answer is, because folks in the Central Administration were trying to run Harvard like a business. In a normal business, it would be pretty simple -- somebody "checks with Legal," and "Legal" reports back what the business is required to do. Decisions get made on how they affect the bottom line and protect the company against risks. Human Resources gets a tip so they can be ready for whiny employees, but there really isn't much more they have to do beyond satisfying their legal requirements. Maybe someone suggests offering the affected employees some help with filing amended tax returns, but there's no budget for that, the quarter looks grim financially already, and Legal suggests that trying to help employees may be creating liability the company doesn't have. So the minimal letter goes out, the revised W-2s follow, and tough luck to anyone who doesn't like it. It's a free labor market, nobody has to work here, and everybody knows the amounts of money involved for any individual are not large enough to quit over. In this sense, running a university like a business doesn't work, either practically or ethically. It doesn't work practically because the whole university is a free speech zone -- and a free speech zone full of smart people who know a lot and are sometimes afflicted with idealism. Word gets around, people compare notes, and eventually someone blows the whistle. It sounds like that January 21 letter did not have a prayer of succeeding -- not when it went to 11,000 Harvard employees. And it doesn't work ethically either, because universities pride themselves in truth-telling, on treating people with respect and dignity, and so on. Our business product is the truth, and training in the art of the search for the truth. We teach lessons in everything we do every day, even in how we respond to incorrect W-2s. Our whole system is set up to ensure that educational and ethical values are pre-eminent. Our chief executive, for example, is a professor, not someone whose last job was being CEO of some other kind of business. I understand how the business departments of the university can become isolated from its educational mission. We want accountants who are trained in accounting, not in French literature. They don't sit around all day talking about the larger mission of the university. Their instincts quite properly may have been to help Harvard be run like a business. But somewhere up the chain of command someone should have said, "This would work at Pepsi-Cola, but it's neither right nor workable at Harvard." Indeed, since 11,000 people got these letters, there must have been lots of people in lots of command chains to whom that thought must have occurred. Somewhere a decision was made to do the wrong (if lawful) thing, and I'll bet it was because that was thought to be the way you run a business. However it happened in detail (I haven't a clue), I'll bet it in some larger sense it happened because of the corporatization of Harvard, the sublimation of educational and moral values to demands to meet short-term budget goals and minimize certain risks. I am grateful to Professors Warren and Halperin for taking the time to explain the situation to the community, for going to the effort to sit down with University administrators and to get them to reconsider their original, shortsighted remedy. And I am grateful to Harvard for doing something it almost never does -- acknowledging, by its actions, that it made a mistake and needed to correct it. RIP Leo's, the greasy spoon on JFK St just above Mt. Auburn St. It was never a special haunt of mine, but it was a regular haunt. I did like going there for a big breakfast after my semiannual fasting blood work at UHS. It was, like Charlie's Kitchen, more of a working class place than a student or faculty hangout, not that it was unwelcoming to anyone. It's gone now, meeting up with Elsie's and the Tasty and the Wursthaus, wherever old Harvard Square dives go to rest at the end of their toils. So many choices. So little apparent vision. Here's the way the questionnaire, which seems to have been sent to thousands of people, frames what is intended. "work with the design of the existing building to restore and modify Sert's architecture, and further contribute to the dynamic urban environment of Harvard Square and Cambridge." What I had not said before, because I didn't notice it until I was reading Harvard Magazine's news updates last night, was the cost: $80 million. My goodness. That used to be considered real money. Money enough to build a new building, or two. Money enough to endow a score of professorships, maybe in VES so they wouldn't have to lottery their courses all the time. Money enough to endow a significant amount of financial aid, relieving pressure on the unrestricted budget, and maybe making life a bit easier for some graduate students. Maybe even money enough to knock a few hundred dollars off the cost of attending Harvard. Some day maybe I will write a book about why higher education costs so much. I have lots of good examples, but I won't ever be able to use most of them. Sometimes the costs come from bad decisions. Sometimes the costs come from not making any decisions at all but using up a lot of people’s time not making them. Someday, perhaps, we will understand how in an era of budget deficits, the Smith Campus Center became a high priority at a high price. The Honor code was discussed at the FAS faculty meeting yesterday. Dean Jay Harris presented it, and Melissa Franklin, Arthur Kleinman, and I commented briefly. Harvard Magazine has a fuller account than the Crimson. Professor Franklin asked the obvious question, given all the talk about this honor code being a way to bring students into partnership with the faculty rather than having the faculty act as their superiors. Why not expect the faculty to sign the honor code too? Even what is likely to be the most sensitive question, whether students will be required to write out the mandated pledge on every piece of academic work they submit, was supposed to be off the table for discussion. Professor Kleinman sensibly noted that the form of the pledge was his biggest worry. It risked turning moral matter into a legal matter. Dean Harris seemed to agree, but immediately said that it was, after all, a legal matter; we couldn't escape that. Actually, I am not sure that followed. The rules about cheating are already in place; it seems to me that, unless existing rules about cheating are rescinded, the only new thing the mandatory pledge would add legally is a new rule that refusing to take the pledge would be unlawful. This point was muddy enough that I felt I should get absolute clarity. When Dean Harris said that students would be "asked to" sign the pledge or "expected to" sign the pledge, did he mean they would be required to sign the pledge? he answered in the affirmative. So the lack of discussion was not surprising; we had little in the way of an argument to think about before the meeting (though those of us who had been at the Town Meeting had a bit more, to the extent we could remember the arguments in the report without a text to refer to). I continue to be troubled by the whole proposal for theoretical, practical, and what I am going to call humane reasons. Interestingly, this is a disputed point. Not what the Founders may have thought, but whether they were right in thinking that oaths are powerless to bind conscience. To support the view that oaths are not powerless, a psychology professor cited a study concluding that people who were asked whether they were going to vote and said yes were more likely to vote than people who were not asked. I am not a professional psychologist, but it seems a stretch to use that as an argument for forcing people to take an oath. In any case, I find it repellent to turn this matter of academic integrity into an exercise in applied psychology. Perhaps we should just bring in folks from the advertising industry, who are so skilled at getting us to do things we might not otherwise do, to help us brainwash the student body. Surely, when we talk about academic integrity, we should honor the principle that each of us is in command of our free will. The really dishonorable thing would be to suggest that some random exogenous circumstance, the noise in the room or our failure to say our daily incantation, was a reason for our moral failure. As a practical matter, I still don't know what problem we are trying to solve or why this change should be expected to change it. I try always to remember that the first step in solving a problem is to know what problem you are solving. We got no data, except for a number or statements to the effect that the research shows that schools with honor codes have less cheating than those that don't. But we got nothing in the way of data about our own cheating, whether it is really on the rise, who does it, whether certain courses are problematic, etc. We got nothing about whether the Ad Board is a problem, either because it is making bad decisions, or taking too much time or money in making them, etc. At a minimum, we ought to have some criteria for success or failure before we change things, unless we don't care about success or failure. Which takes me to the humanity of it all. It is not so hard to apply rules about plagiarism and other forms of cheating unflinchingly, and to mete out formulaic penalties. The only time it gets tricky is if the judgments being made are considered educational, because then you have to look into the soul of the miscreants and make subjective judgments about what response will prove, later in their lives, to have been most constructive. That requires maturity, maturity which in my experience even new deans do not have until they had been around the block for a year or two. I have a lot of respect for students and how much smarter they are in many ways than the faculty are. I plan all my courses in collaboration with my undergraduate course assistants; they are much better than I am at anticipating how the incentives and rewards will work in the minds of students. But they are not mature enough to be making subjective, educational decisions about the souls of their classmates. The fact (if it is true) that students want an honor board is about as relevant as was the fact that students wanted, twenty years ago, to pick which House they would live in. It doesn't matter what a plebiscite would yield if it is an educationally inferior outcome. If, on the other hand, we are giving up on the educational role of the disciplinary process, and turning it into a simple matter of crime and punishment, then the honor board may make sense. But I should not be blogging about the honor board yet, since it was explicitly divided from the discussion of the honor code, but of course these are connected. We can't discuss either without discussing both and without saying more about why we are going to do what is proposed. 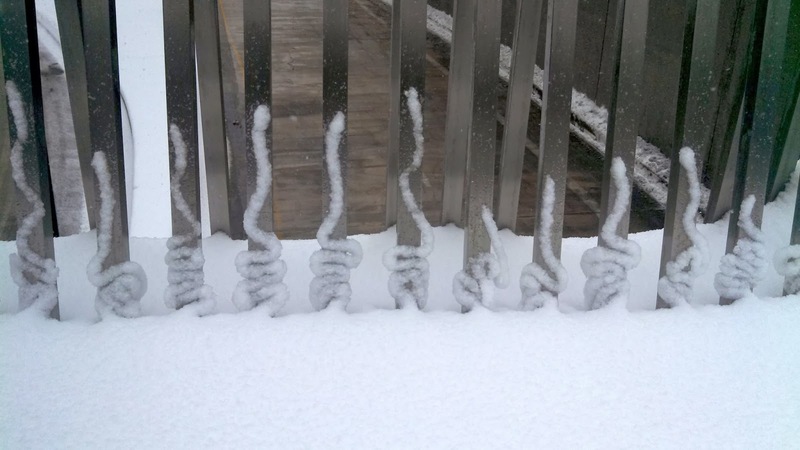 The designers of the metal slatted seating recently installed on the overpass in front of the Science Center could not possibly have realized that it would do this when the precipitation and temperature conditions were just right. Could they? Why Are There So Many Course Lotteries? I signed a lot of study cards last week, not just because I am Director of Undergraduate Studies and have picked up a lot of advisees this term from faculty on leave, but because it seemed like every other student who came in had two or three study cards for me to sign. They listed various combinations of courses, and while a few students just didn't want to decide until the last possible moment, most of them were waiting for the results of course lotteries – the process by which limited enrollment courses are whittled down to size when too many students want to take them. Limited enrollment courses have been around forever. Seminars obviously have to be capped, because they wouldn't be seminars otherwise. I once decided to lift the cap on my freshman seminar from 12 to 15, because about 60 students wanted to get in. It was a big mistake. Talking in a group of 13 is different from talking in a group of 16. Courses with unusual equipment or classroom demands sometimes have to be capped. Again, film courses have long been capped, because cameras and whatnot are costly. As we move away from lecturing to flat-floor classroom teaching, the shortage of appropriate teaching spaces creates capacity problems. These are exaggerated, in the case of Computer Science, by huge enrollment swings in our direction. Our teaching facilities were not designed for the numbers of concentrators we have, and it is awfully costly to renovate space even if the space exists, which it doesn't. I know this is a problem in the lab sciences as well. It is a fair question whether the earnest efforts we have gone to in order to increase enrollments were matched by earnest planning about what would happen if we succeeded. In some fields, enrollment caps are a response to a shortage of TFs. CS has this problem for graduate courses (yes, some graduate coursed draw multiple dozens of students). Most undergraduate courses use many talented undergraduate course assistants, a resource which happily grows and shrinks in almost direct proportion to the enrollments in the courses. In humanistic fields that doesn't work, and even a small reduction in the number of PhD students makes the TF shortage even more acute. All that said, I can't ever remember a year when I had such a strong impression that lotteries are now accepted as a part of ordinary undergraduate life at Harvard. The difference is that a lot of the courses being lotteried are big courses, not small ones. They are General Education courses, not boutique courses on specialties that have suddenly become trendy. The Crimson reports on this a bit today, listing some of the lotteried courses, and also noting, importantly, that not all "lotteries" are run the way the Numbers Game is run. What is politely termed a lottery is actually a second admissions process, as though, having gotten through the eye of the Admissions Committee's needle and made your way to Harvard, you should have to prove to a professor that you are worthy of enrolling in his or her Gen Ed course. This seems crazy, and wrong. We got rid of limited-enrollment concentrations some years ago, on the theory that anybody should be able to get an education in any concentration [major] at Harvard, if they were willing to work at it. And now we have filters on Gen Ed courses instead? This is what Harvard students should expect for their $60,000 per year? Sounds more like Berkeley. I wish I understood how this happened. In the old days, Bill Bossert used to repeat his lectures in Nat Sci 110, a classic Gen Ed course on computer science, because there was no lecture hall big enough to hold the whole class. That was extreme, but I wonder if there has not been an erosion of an old feeling that teaching was a mission, not just a job, and if a lot of students wanted to learn from you, it was an honor rather than a nuisance. One hears that some courses are limited just because … the professor doesn't like teaching big courses. That seems wrong. It seems to me a pretty simple expedient would solve most problems of over enrollment in large courses. Teach them at 9am! That would dis-enroll the gut-seekers and schedule-fitters, and would leave the professor with only the most committed students to teach. I really don't know why my colleagues don't try this -- in fact why not make it a rule? Any course lotteried one year has to be offered at 9am the following year. Bingo. Many fewer lotteries.